Sometimes ignorance is bliss, and this is certainly the case when it comes to the various species of disgusting creatures that live in, on and around our bodies. If you had a powerful enough microscope to see just how many creepy crawlies were all over you right now and to see just how ugly some of them were, then you’d probably spend your entire life bathing. Your belly button is practically a nature reserve. Fortunately you probably don’t have access to a powerful enough microscope that you can easily look at your own skin crawlies… But then that’s what the internet is for, right? While there are countless different types of bacteria, mites, parasites and germs living all over our bodies, one area that people seem specifically interested in is our eyebrows. The fact that we have creepy crawlies living in our eyebrows – big enough to be classified as mites – is something that’s often used to creep us out. And indeed it’s true that this region – along with our eyelashes and nose hairs – provides a habitat for a specific species of mites which have some rather unpleasant habits. Sometimes these mites are known as ‘face mites’ or ‘follicle mites’, but they are technically known as Demodex. These little mites actually aren’t particularly choosey though and will really live on anywhere as long as they have access hair follicles (or sebaceous glands to be precise). They can live on other parts of the body for instance and are also found on a host of other mammals. In humans though, the face provides the most desirable real-estate. The reason you don’t see these mites is that they only grow 0.3-0.4 millimetres long. They’re also semi-transparent and have a long body consisting of two ‘segments’ and eight short legs. Scales are used by the mites in order to attach to segments of the body, while pin-like mouths are used for eating skin cells and sebum/oil (which is what makes the face such a hot-spot). We aren’t born with face mites, but as you get older you will be likely to pick them up through close contact with other people. Something to think about next time you share a passionate kiss… By the age of 60, it’s almost guaranteed that you will have a selection of mites living on your face. And when I say ‘selection’, I actually mean one to two thousand which is average for an adult. Actually there is more than one type of mite likely to live on your face too. The demodex folliculorum are slightly larger and live in groups – hanging out in your hair follicles like they were hot tubs. 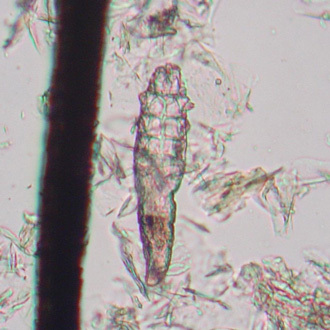 Meanwhile the smaller demodex brevis usually live alone in hair follicles. Only the larger type is believed to feed on dead skin cells. The eight legs of the demodex mean they are technically arachnids – essentially that means you have tiny spiders living on your body. Good news though, face mites don’t have anuses meaning they won’t be leaving faeces on our faces. Face mites will spend the majority of their lives with their heads in our follicles and their feet gripping tightly to our hairs. When the sun goes down (they’re photophobic), they will then look around to find new follicles. This takes a long time as they can only move 1 cm per hour! So aside from just being disgusting, what are the health implications of face mites? Are they bad for us? Or good for us even? Well for the most part it seems they’re pretty much irrelevant with no clear benefits or risk factors. Studies have demonstrated that there is a correlation between face mites and some skin problems like rosacea and acne, but no causal link has been proven meaning it’s just as likely that the mites get attracted by the conditions rather than causing them. There is an exception to this rule – when in rare cases mite populations increase dramatically (usually because of a suppressed immune system) resulting in something known as ‘demodex mite bite’ which is characterised by inflammation and itching. But assuming this doesn’t happen there may even be a slight benefit to having face mites seeing as they eat dead skin cells and oils… Free facial! Thank you, that was quite informative on my behalf! I found this info to answer my questions and concerns. I've been having lots of problems with my face. Like worms coming out of my pores… Soon as I rub my spots good, I'm taking layers of skin off, right to the last layer, before bleeding and still these worm like thingys are coming back, and I scrab again. The next morning HELLOOO… WE'RE BACK! I have been sent to go to a skin doctor to check my face; and I will tell the doctor about my many visitors. Wow, just wow is all I have to say. Unscientific, biophobic. Hair follicle mites may help skin stay healthy, and normal bacterial flora on the skin are beneficial. Can they be killed by washing or using alcohol or any disinfectant?